The Vikings season/hopes/dreams ended unceremoniously at home against the Chicago Bears a few weeks ago in a game that ripped the Vikings fan-base wide open and created multiple angry questions all seeking the same answer, what the hell happened? Surprisingly the Vikings, who were trendy picks to be playing in the upcoming Super Bowl LIII around this time last year (and definitely later in the off-season once they’d picked up quarterback Kirk Cousins), are still favored high (relatively speaking) in terms of the odds that bookmakers are assigning odds for the 2019/20 Super Bowl. However, that’s not really what you should take away from the odds released this week (the earliest in the history of a few sports books), unless you’re looking to prove that you still have faith in the Vikings of course and maybe, just maybe making some money on a team that has yet to win a Super Bowl in over five-decades of existence. Instead, we should look at what team(s) are around the Vikings just to see how much faith the gambling community has in our purple and gold (as compared to other teams) and to see just how irritated we should be by this classic off-season news. First, let’s take a look at the odds, which were added to a nifty visual courtesy of our friends at BleacherReport.com. Now if you’re as big of a fan of Legal Online Betting in the USA, as we are since the law was changed allowing adults to add another level of excitement (and as is typically the case with the Vikings, soul-crushing misery) to the game we all love. You may be surprised that a team that has as much apparent dysfunction as the Packers being ranked as high as the Vikings, which is a team that seemingly is just an offensive line away from contending for a ‘ship in 2019/2020. However, the NFL is increasingly a quarterbacks league especially with the move that many teams are making towards young, offensive-minded head coaches. The Packers have hired a sub-40-year-old head coach in Matt LaFleur and because of what Rams coach Sean McVay has done in Los Angeles and Matt Nagy has done for the Packers other rival in the NFC-North in the Chicago Bears, people are relatively bullish on a Packers team that has a lot more holes than either the Vikings or really any average NFL team. The Packers hire was all based on who could get a long with/get the best out of aging quarterback Aaron Rodgers, who has become the Lebron James of the NFL in terms of his control over “his” team. Beyond that, the Vikings have better odds than teams that made the playoffs like the Philadelphia Eagles (a team that will probably be without its post-season guru in quarterback Nick Foles) and the Dallas Cowboys, both of which won a playoff game. Beyond that, the Vikings aren’t far behind the Bears, a team that was a blocked/missed field goal from advancing as well. In terms of the NFC, the Rams and Saints are the only teams ahead of the Bears, meaning that the odds have the Vikings as the fourth-best team in the NFC. The only surprise, to me, from the AFC, is how highly ranked the Colts are, but then again they did end the season on quite the tear with Andrew Luck looking every bit the quarterback people expected earlier in his career. 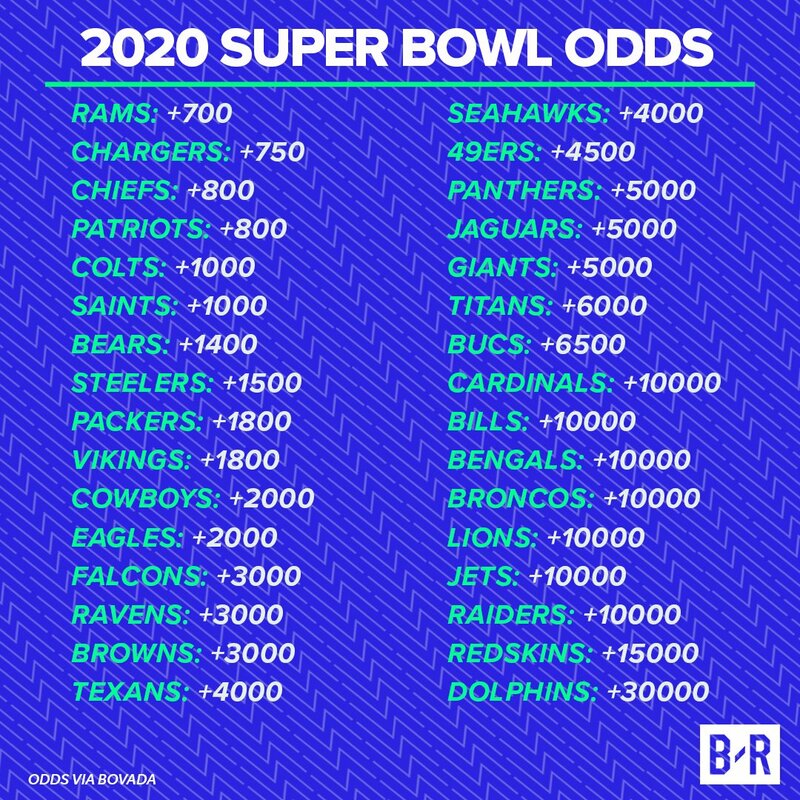 Hopefully, the Vikings will be able to sort out their issues this off-season as it’s safe to say that it’s still Super Bowl or bust regardless of what happened in 2018/19 and regardless of what the people behind the billion-dollar betting industry say. I think it’s safe to say that as long as we’re not trailing the Packers then this is all good news, although it’d be even better news for those of us who put their money where their mouth is by betting on the Vikings for next season, because all of the money those Patriots fans win has to come from somewhere.